sStephanie Tow lost the 48 pounds she gained during her first pregnancy, and then some — here, why she never wants to hear the word diet in her house. I’m 6 feet tall, so I’ve always been a little bigger than everyone else, but my struggle with weight really began when I got pregnant with my daughter Emma. I was finishing up college, where it’s already hard to find healthy food, and I ate everything in sight — chips, pasta, bread, and pickles. Every time I put something in my mouth, I felt so guilty — but I just couldn’t stop. Toward the end of my pregnancy, I couldn’t even fit into the chairs at school. When Emma came out weighing 6 pounds — and not the 48 pounds I put on during my pregnancy — I knew it wasn’t all baby weight I had gained. At the time, my husband, Dustin, and I joked that as a couple, we looked like the number 10 because he’s a stick and I was so round. I laughed about it, but it was hard both physically and emotionally carrying around the extra weight: I was 23 years old and always out of breath, and I couldn’t fit into younger, hip clothing. In February 2006, two-and-a-half years after Emma was born, we had a family reunion. My family was complimenting my older sister, Jessica, on all the weight she’d lost on Weight Watchers after having her two sons ó and they complimented me on my nice hair. It made me feel awful that I was the fat sister with good hair. That’s when I knew I had to do something about my weight. “I knew my sister’s weight loss would push me to lose weight too.” After we both had kids and had weight to lose, Jessica and I used to play this game where we would walk to the back wall of “skinny stores” and walk back out again to see if the clerks would actually ask us if we needed any help. So many times they didn’t. My sister and I have always been in competition, so I knew that her weight-loss success this time around was going to push me to lose weight. I asked her about the Weight Watchers program and started trying low-Points recipes I found online. I also started a food journal and wrote down every little thing I put in my mouth. That’s when I really noticed all the small snacks I ate, like a handful of chips here and a few cookies there. The whole time, I was telling Jessica about my efforts, and that’s when she had this idea to create a private online blog for just us. We called it Think and Thin — we blogged every day about what we ate and how our days were going; every Monday we’d post our weight on the site to track our progress. My sister held me to doing the things that I said I would do, such as skipping second helpings. Jessica’s feedback and support helped me to lose 38 pounds in less than three months. Sure, there have been challenges: Dustin and I moved right before I got pregnant with our second daughter, Ellie, and being a stay-at-home pregnant mom in a new neighborhood made it hard to resist the food that was only 10 feet away in the kitchen. I was worried that I was going to pack on the 48 pounds I did with my first pregnancy, but this time I really watched what I ate, started walking, and gained a reasonable 18 pounds. I lost the weight plus another 2 pounds the week Ellie came home from the hospital. I feel much sexier now that I’ve lost the weight, and today I’m just 10 pounds away from my goal. I’m not a vain person, but I love that I get noticed by men more now when we go out. My husband would love me whether I was a size 2 or 22, but he wanted me to lose the weight because he knew it was making me unhappy. I also love that I’m three sizes smaller and can shop at the skinny stores now, and that I have energy to keep up with my two girls without running out of breath or my pants splitting. My husband promised me a $500 shopping spree when I reached my goal — I don’t think he thought it would happen so soon! I know that these lifestyle changes I’ve made for myself and my family will stick. If my daughters never have to know what a diet is, that would be the best thing in the world to me. 1. Quit late-night snacking. I was never a huge late-night snacker, but now we eat dinner early — around 6 p.m. — so we have time to take a walk with the girls. When we get back, there may be time for a little snack like ice cream, but after 8 p.m., there’s no more food. 2. Drink water. If I’m feeling hungry, I drink two glasses of water before eating anything. It usually takes me so long to drink the water that I forget I was hungry in the first place. 3. Plan meals. I make a two-week menu plan, and then we go grocery shopping as a family. It helps me stick to a healthy-eating plan and keeps me from buying lots of snacks and unnecessary foods. We do make it fun: We each get to pick one treat every time we go to the grocery store. Last time we went, Dustin got Fireball candies, I got tricolor pasta, and Emma picked out Spaghettios. 4. Watch portions. I’m a tall girl and need more calories, so those little salad plates don’t work for me. I use a normal dinner plate but don’t put any food on the outside rim. 5. Make exercise fun. During the day, I’ll take the girls out for a walk to the post office or store. Emma will get in her mini Cadillac Escalade, and I’ll carry Ellie in the Snugli. At 18 pounds, she’s my weighted walk vest — it’s a workout to carry her! We also try to do mini-workouts at home, which consist of a vigorous three-minute tickle-monster warm-up with Ellie, followed by a 45-minute dance session with Emma. Or I’ll try to do 30 minutes of Pilates for Dummies. When Stephanie Tow started her blog, she was mostly looking for a forum to vent about the downers of dieting. Little did she know, blogging incorporates three elements that research shows are essential for long-term weight loss. Stephanie and her sister wrote daily about their dieting efforts, sharing what worked and what didn’t, plus advice and encouragement. And according to research at the University of Pittsburgh School of Medicine, dieters who have the support of loved ones are more likely to shed pounds than those who attempt to slim down solo. “Having people around who support your efforts will help you sustain them — true friends reinforce positive, healthy changes,” says Elisa Zied, R.D., author of Feed Your Family Right! 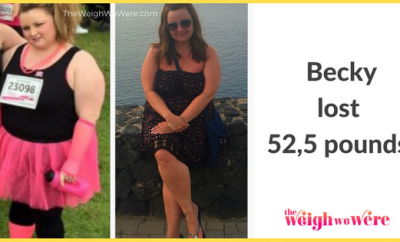 Once a week, Stephanie and her sister stepped on the scale (and then posted their weight! ), a habit that can more than double weight-loss success: Participants in one University of Minnesota study who weighed themselves weekly lost an average of 6 pounds, while those who avoided the scale gained 4 pounds on average. “Weighing yourself can alert you to when your weight is creeping back up so you can take action and stop the slip,” says Zied. How to Build Your Own Diet Blog It’s easier than it sounds. The first step is finding a Website to host it — we like blogger.com, movabletype.com, and typepad.com, all user-friendly sites that offer easy-to-follow directions for establishing and personalizing your blog. Pick a name that’s easy to remember and spell, and decide whether you want a public blog, which is accessible to anyone with Internet access, or a private one (like Stephanie’s), which requires a password. And voilà, you’ll have your own weight-loss support group!